Children without parents are popular with novelists, too, allowing them to tell exciting stories that rely on the characters’ own skills to survive and thrive. ‘Flying to Neverland’ by Stephen ‘Stref’ White from Peter Pan The Graphic Novel, based on the book by J. M. Barrie (BC Books, 2015). Top: Angela Barrett, Snow White’s Mother, 1991. 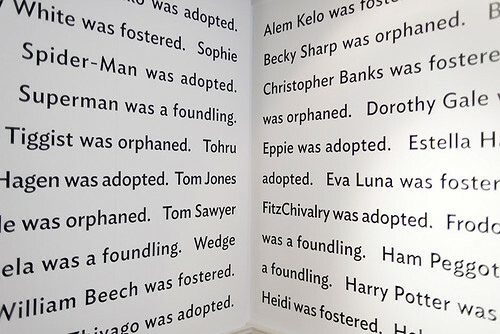 Installation image of Lemn Sissay’s poem Superman was a Foundling in the Foundling Museum’s café. 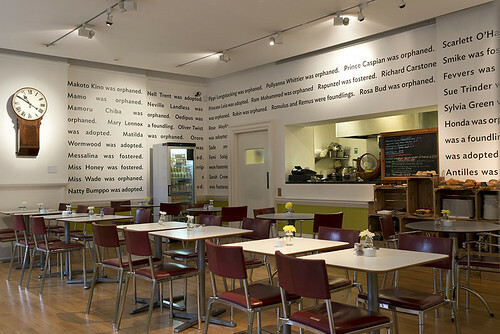 ‘Drawing on Childhood’ was inspired by Lemn Sissay’s poem Superman was a Foundling, a Foundling Museum commission currently displayed in large sans type on the walls of its café. Sissay’s alphabetical list goes from Benjamin Zephaniah’s Alem Kelo to Boris Pasternak’s Doctor Zhivago by way of Star Wars’s Luke Skywalker and Princess Leia (both adopted). The work on display spans more than two centuries, including illustrations for fairy tales (collected by Charles Perrault and the Brothers Grimm, among others) by George Cruikshank, Walter Crane, Arthur Rackham and Edmund Dulac. 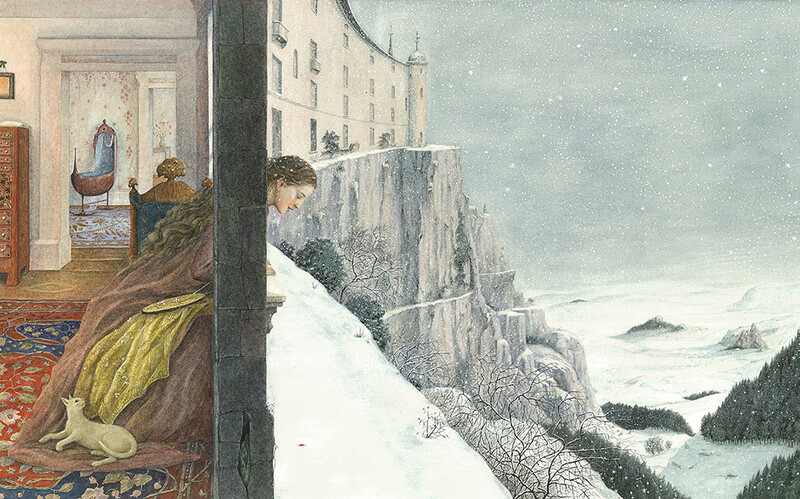 One of the most widely known tales is Snow White, the subject of Angela Barrett’s stunning Snow White’s Mother, in which the warm-toned, richly decorative, enclosed interior contrasts dramatically with the vast spaces of the icy exterior, with its single drop of red blood on the white snow. Walter Crane’s opening spread of Rapunzel for an 1882 edition of Grimms’ Household Stories shows evidence of his background as a designer. Its main full page image is surmounted by an ornamental headpiece, framed with corner illustrations and surrounded by decorative borders. The opening letter of the text is a dropped cap ‘T’ nestling on top of a miniature drawing of the rapunzel (a salad vegetable also known as lamb’s lettuce) that tempts the pregnant queen. David Hockney tackles the same subject in ‘Rapunzel Growing in the Garden’ (1969) from Illustrations for Six Fairy Tales from the Brothers Grimm. Illustrations for famous nineteenth century texts are here aplenty. Those for Dickens’ Oliver Twist come from Henry (Harry) Furniss and Phiz, as well George Cruikshank’s famous image of ‘Oliver asking for more’. Great Expectations also features, with George Percy Jacomb-Hood’s watercolour drawing of ‘Miss Havisham and Pip’, among others. Charlotte Brontë’s Jane Eyre has several twentieth-century illustrations, such as those from Ethel Gabain (1923), Fritz Eichenberg (1943) and Karel Müller (1969); and twentieth-century texts are well represented, too, with interpretations of J. M. Barrie’s Peter Pan ranging from Rackham to Mabel Lucie Attwell to Stephen ‘Stref’ White’s 2015 graphic ‘Flying to Neverland’. 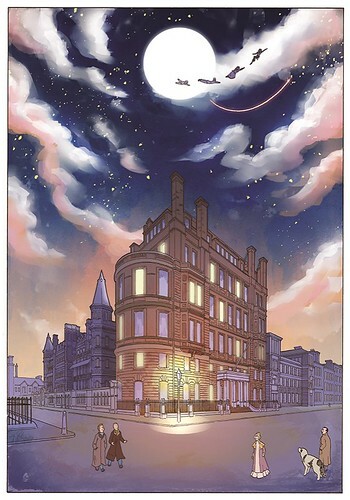 More contemporary illustrations include Quentin Blake’s illustrations for both Roald Dahl’s Matilda and James and the Giant Peach, Nick Sharratt’s black and white silhouettes for Jacqueline Wilson’s Hetty Feather and Jim Kay’s wildlife-packed illustrations for a new 2015 edition of the Harry Potter series. Thomas Rowlandson, illustration from Tom Jones, 1791 © The British Museum, London. The earliest illustrations are Thomas Rowlandson’s pictures for a 1791 edition of Henry Fielding’s The History of Tom Jones, A Foundling (1749), a book that has prompted three new commissions from Chris Haughton, Posy Simmonds and Pablo Bronstein. Haughton’s witty red, black and white image depicts a naked Tom and lady caught in flagrante in a four-poster bed; both are looking directly at the viewer, as though snapped by paparazzi. 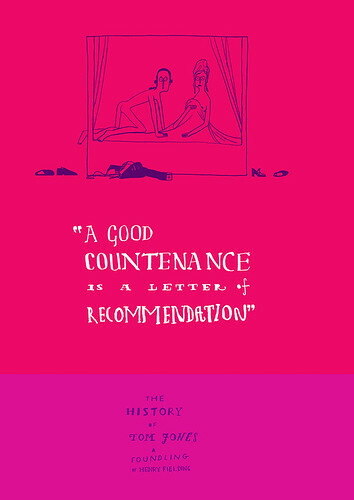 Chris Haughton, A Good Countenance is a Letter of Recommendation, 2015. © Chris Haughton. 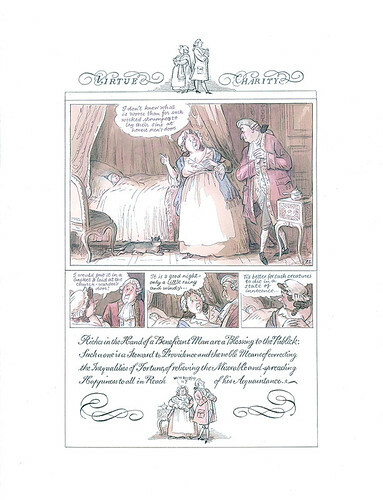 Simmonds’ work combines her distinctive and witty graphic panels with elegant calligraphy, inspired by a 1741 essay in The Universal Penman. 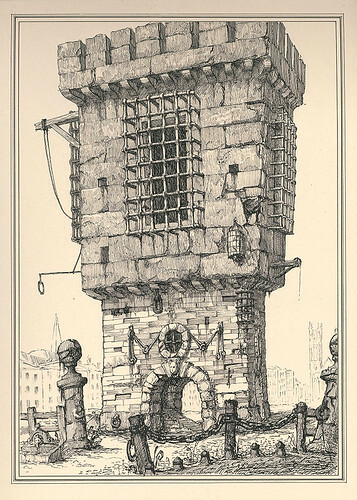 Bronstein’s pen-and-ink drawing of the Gatehouse Prison is a chillingly detailed yet fictional image of a sinister, decaying ‘prison for one’. In an accompanying video, Bronstein says he was disappointed in the real-life Gatehouse Prison, so he hammed the prison up in a Piranesi fashion… ‘I’m interested in architecture and humans, and the way we create things that mirror or oppress us,’ he says. Pablo Bronstein, Gatehouse Prison, 2015. © Pablo Bronstein, courtesy of Herald Street. All the illustrations in this exhibition act as mirrors to the period in which they were created, including Chris Haughton’s. 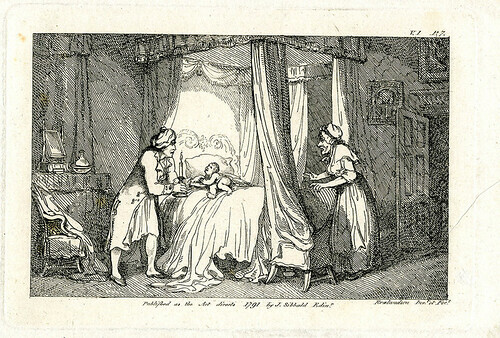 As he explains in the caption to his 2015 illustration, there was a perception in the eighteenth century that orphans should not be taken in because it would encourage mothers to leave more children on the streets. He says: ‘This attitude seems absurd to us now, yet the same argument has recently been made about Syrian refugees crossing the Mediterranean. Our only hope to battle prejudice is empathy.’ The perennial struggle against war, famine, disease and poverty continues. 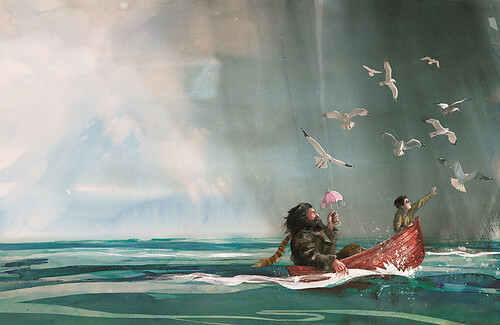 Illustration by Jim Kay from the illustrated edition of J. K. Rowling’s Harry Potter and the Philosopher’s Stone, (Bloomsbury Publishing, £30). ‘Drawing on Childhood’ continues at The Foundling Museum in London until 01 May 2016. Lemn Sissay, Superman was a Foundling, 2014, © The Foundling Museum.